Berkeley — Global decline of wildlife populations is driving increases in violent conflicts, organized crime and child labor around the world, according to a policy paper led by researchers at the University of California, Berkeley. The authors call for biologists to join forces with experts such as economists, political scientists, criminologists, public health officials and international development specialists to collectively tackle a complex challenge. "This paper is about recognizing wildlife decline as a source of social conflict rather than a symptom," said lead author Justin Brashares, associate professor of ecology and conservation at UC Berkeley's Department of Environmental Science, Policy and Management. "Billions of people rely directly and indirectly on wild sources of meat for income and sustenance, and this resource is declining. It's not surprising that the loss of this critical piece of human livelihoods has huge social consequences. Yet, both conservation and political science have generally overlooked these fundamental connections." Fewer animals to hunt and less fish to catch demand increasingly greater effort to harvest. Laborers – many of whom are children – are often sold to fishing boats and forced to work 18-20 hour days at sea for years without pay. "Impoverished families are relying upon these resources for their livelihoods, so we can't apply economic models that prescribe increases in prices or reduced demand as supplies become scarce," said Brashares. "Instead, as more labor is needed to capture scarce wild animals and fish, hunters and fishers use children as a source of cheap labor. Hundreds of thousands of impoverished families are selling their kids to work in harsh conditions." The authors connected the rise of piracy and maritime violence in Somalia to battles over fishing rights. What began as an effort to repel foreign vessels illegally trawling through Somali waters escalated into hijacking fishing – and then non-fishing – vessels for ransom. 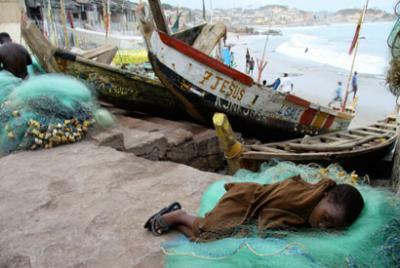 A child grabs sleep wherever possible after a long day of labor in West Africa's struggling fishery. "Surprisingly few people recognize that competition for fish stocks led to the birth of Somali piracy," said Brashares. "For Somali fishermen, and for hundreds of millions of others, fish and wildlife were their only source of livelihood, so when that was threatened by international fishing fleets, drastic measures were taken." The authors also compared wildlife poaching to the drug trade, noting that huge profits from trafficking luxury wildlife goods, such as elephant tusks and rhino horns, have attracted guerilla groups and crime syndicates worldwide. They pointed to the Lord's Resistance Army, al-Shabab and Boko Haram as groups known to use wildlife poaching to fund terrorist attacks. "This paper begins to touch the tip of the iceberg about issues on wildlife decline, and in doing so the authors offer a provocative and completely necessary perspective about the holistic nature of the causes and consequences of wildlife declines," said Meredith Gore, a Michigan State University associate professor in the nascent field of conservation criminology who was not part of the study. "The most important bit from this article, I think, is that we need to better understand the factors that underlie fish and wildlife declines from a local perspective, and that interdisciplinary approaches are likely the best option for facilitating this understanding," said Gore. "This prescribed re-visioning of why we should conserve wildlife helps make clearer what the stakes are in this game," said UC Santa Barbara assistant professor Douglas McCauley, a co-author who began this work as a postdoctoral researcher in Brashares' lab. "Losses of wildlife essentially pull the rug out from underneath societies that depend on these resources. We are not just losing species. We are losing children, breaking apart communities, and fostering crime. This makes wildlife conservation a more important job than it ever has been."